I make these for parties all the time. They’re not only simple to make, but look really cute and are a good dessert for mingling guests to eat without making a mess. I’ve never used an actual recipe for these, so this is what I have come up with. Melt chocolate slowly using a double boiler or a saucepan over low heat, stirring constantly. This is important, as you don’t want to burn the chocolate. 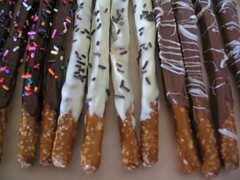 Dip pretzels (or use a spatula to spread). Place pretzels on wax paper to set. I make these for clients took … they present so nicely, and are so easy to make. Diana…I just sent you an email! here’s my question : did you temper the chocolates? and after putting it in the fridge, did the chocolates bleed? were there moisture? 2nd question (sorry for being such a bother) : do you have any chocolate frosting recipe that won’t melt or get disfigured if it is to be transported from one place to another and from being in hot room temperatures? ooh I like these, easy and beautiful! will definitely make some! They’re kinda like Pocky! wow I am so happy I found your website. I wanted to make these for christmas gifts and for a fund raising event I have coming up soon. My question is can I use choc. chip morsels( white,semi,milk choc)???? after putting in fridge can they be kept out without melting? I was going to put in bags and sell at fund raiser so i needed to make sure. Thanks for your help and this website. We are making these preztels today and we think they will melt in the plastic baggies after they are not in the freezer anymore??? Advice??? Unless you temper the chocolate, they most likely will melt after being in the bag for a while. I kept them in the fridge until shortly prior to serving them.